Oh the difference a week can make! Although I was in Melun last weekend (50km from Paris), we live 350km away. Nonetheless, the entire nation has been affected and it’s been a little surreal to live here at this time. 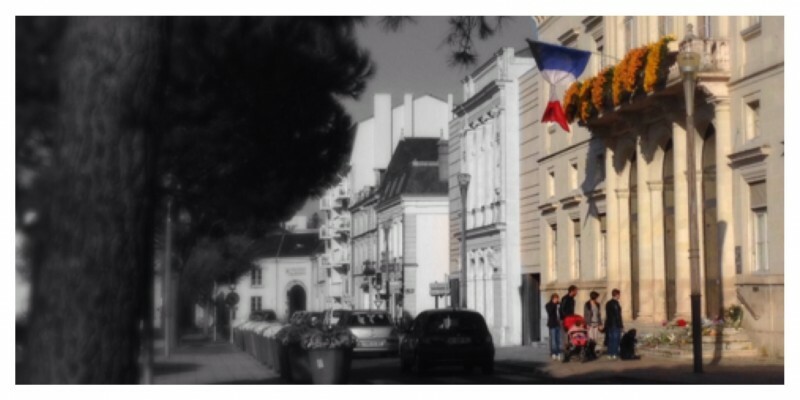 Even in our quiet provincial town of 35,ooo, within hours of the attacks, people began bringing flowers, notes of tribute and lighting candles on the steps of La Mairie (City Hall) in memory of the victims. It was moving to walk by there on Sunday afternoon and see a steady flow of people, of all ages, making their contribution to the makeshift memorial… pausing to read and contemplate others’ contributions. This was part of mourning… part of grieving. 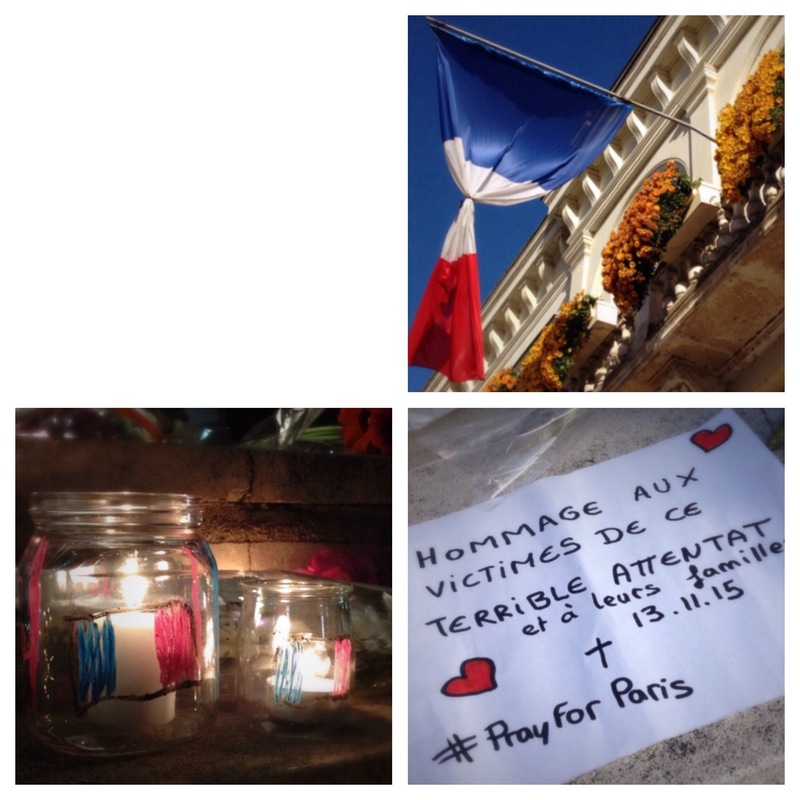 One thing that struck me was that, far removed from English-dominated world of social media or internet news, the English hashtag #PrayforParis would find its way onto handwritten notes on the steps of our city hall (English is not as common here as in larger centers). For the French to so openly evoke prayer is no small thing. Given the use of #PrayforParis… throughout the country, we’ve developed an outreach tool that we plan to use within the next two weeks. It’s simply an oversized business card showing the Eiffel Tower and Châtellerault’s Henry IVth bridge. On the back it has 3 verses to communicate Christ’s care and purpose for us… even in the midst of troublesome times. This will be a bold undertaking for our little church. Please join us in prayer. Kids everywhere are aware of events in Paris this week. 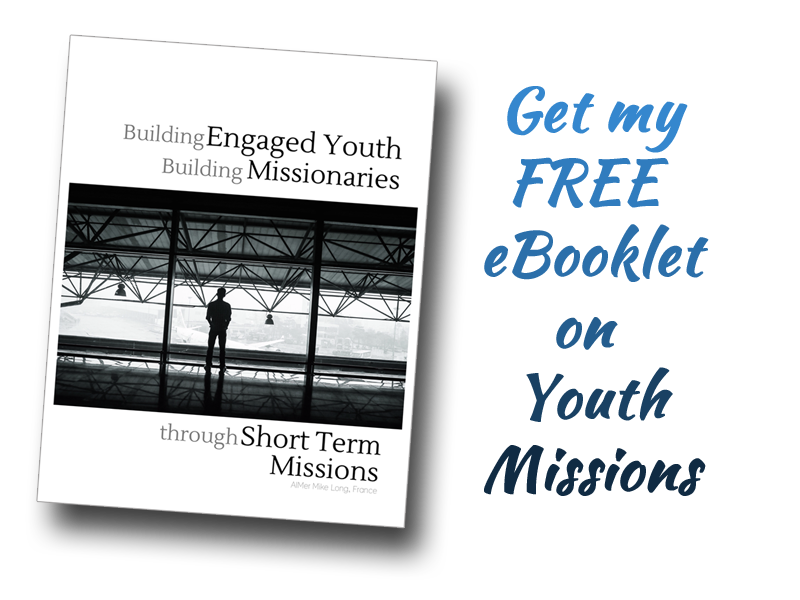 Would you like a ready-made, 5-min object lesson to connect kids & youth to their own missions potential? Last night our home church in Saint John kicked off their annual World Missions Conference with guest speakers Raymond Woodward, Jack Leaman and Allan Calhoun. This is the first time in 18 years that we won’t be at Missions Conference. Given our love for missions, this was always a highlight. What’s more… Bros. Woodward and Leaman were on staff in the Saint John church when Liz & I began attending back in the late 1990’s. I take comfort in the fact that, in one way, we’re closer to missions now than we ever were! Tomorrow I will be rising early and boarding a train for Paris where I will be speaking at the church in Paris-Centre (the other church over which Bro. Brochu has responsibility), I’ve been there before. In Bro. Brochu’s absence it has been pastored by fellow AIMers Dean & Loreen Byfield, who’ve been doing an excellent job! Glad to go back there tomorrow. Pray for traveling safety and for a powerful move of God in service there as well as in Châtellerault. Thank you for visiting today… let what you read inform your prayers for us and for France. It is such a small world! I know Bro. Dean Byfield, my old pastor went to Bethel UPC in NY with him and I believe was his youth pastor. Hope the outreach effort goes well, people are definitely more open the more desperate they are. Believing for revival in France and all of Europe! Very cool Sis! Was your old pastor Bro. Linder?